Making meals, snacks and desserts with grandkids are fun ways to spend time together. 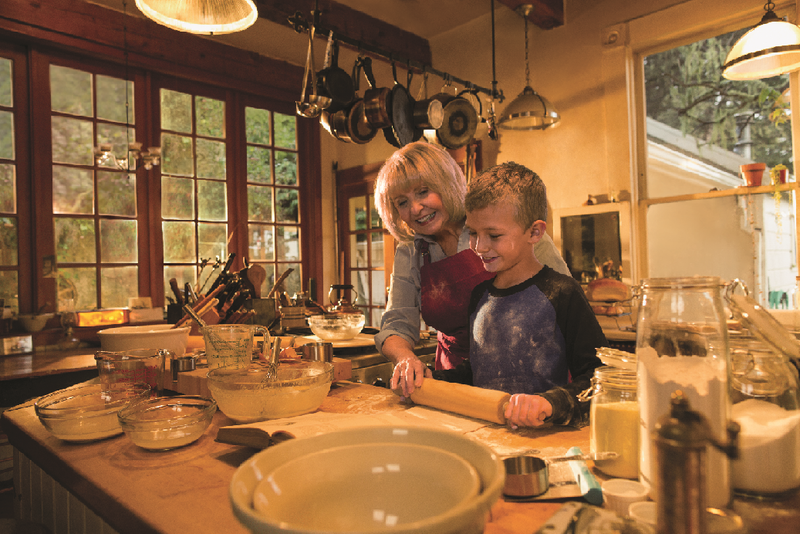 There are lots of reasons why grandparents cook with their grandchildren. First and foremost, it’s fun – whether you bake, make a fun snack or work together on a meal! Most kids love to measure, mix, stir and pour. True, it might be messy as flour sometimes ends up on the counter and floor, but the benefits far outweigh the mess. 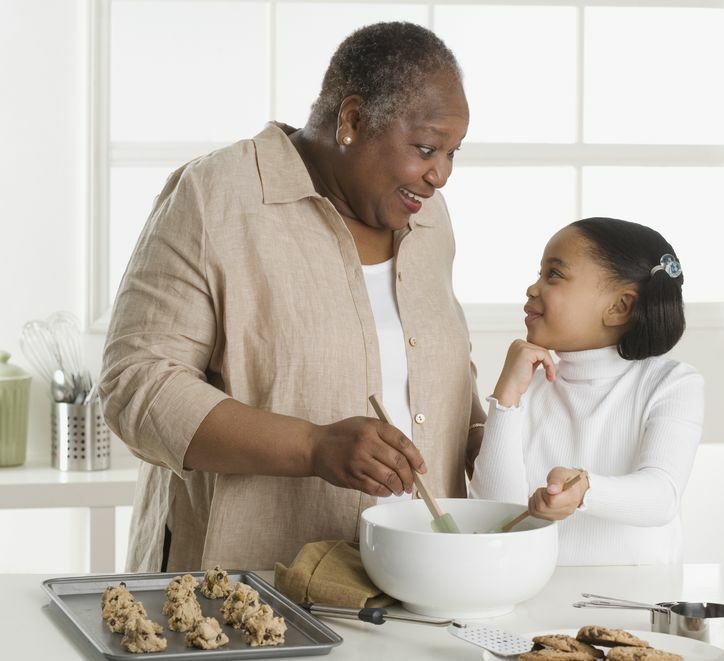 Cooking with your grandkids builds precious memories right along with learning about good nutrition and practicing skills like measuring, reading and safety in the kitchen. Following these simple guidelines will help make cooking safe and fun and may even entice your grandchildren to try something new! • Begin by washing your hands before you start cooking. Modeling and insisting on this practice is essential. • Start with a simple dish, such as a smoothie, a cookie recipe, or even a tossed salad. Allowing your grandkids to choose one of your selected recipes will ensure success! Choice gives kids a sense of value and accomplishment as their personal preferences are honored. • Make sure your time schedule is flexible. If you are feeling rushed or have somewhere you need to go, that’s not the time to begin cooking with your grandkids. • Plan ahead to ensure that you have all the ingredients on hand. • Think about which steps your grandchild can do independently. A younger child can help pour ingredients and stir, while older children may be able to read the recipe and measure out ingredients unassisted. Picture cues can be added to a recipe so that young children can better interpret the ingredients and measure accurately. While cooking with you, they learn about planning ahead, taking turns, measuring amounts, and following sequences. • Supervise children closely. First, create a safe place where smaller ones can cook, maybe a lower height or a safe stool, and make sure to remove sharp objects from their reach. If heating ingredients on the stove or using the oven, young children might need safety reminders. Make sure utensil handles are turned towards the back of the stove. 1. With clean hands, mix flour and baking powder with the shortening. Add sea salt to the warm water. Gradually sprinkle the 1 cup of water over the flour/shortening mix, and knead dough into a large ball. Cover and let rest for 15 minutes. 2. Using a regular table knife, cut dough into 12 equal sections, forming little round balls you press with the palm of your hand. On a clean cutting board or counter top, use a small rolling pin to roll tortillas as thinly as possible (add a little flour to board and roller). Preheat iron skillet and cook tortillas on medium heat, flipping each side after 15 seconds (or as bubbles appear). Enjoy them warm with a little butter or create Mexican favorites like quesadillas. Tortillas are great to make with kids because they’re so hands on, from the kneading to the rolling, and the end result creates a quick meal or snack. Grandparents get something out of this kitchen togetherness, too. The quality time you share and the pleasure of sitting down with one another to enjoy what you’ve created, is the best part! A veterinarian shares her stories of adopting adult and senior pets and explains the benefits of choosing an older animal. Choosing eco-friendly destinations helps preserve the environment for future generations to enjoy.